Color Me Rad Review by Ana Picazo | Color Me Rad 5K -- the perfect family fun run! 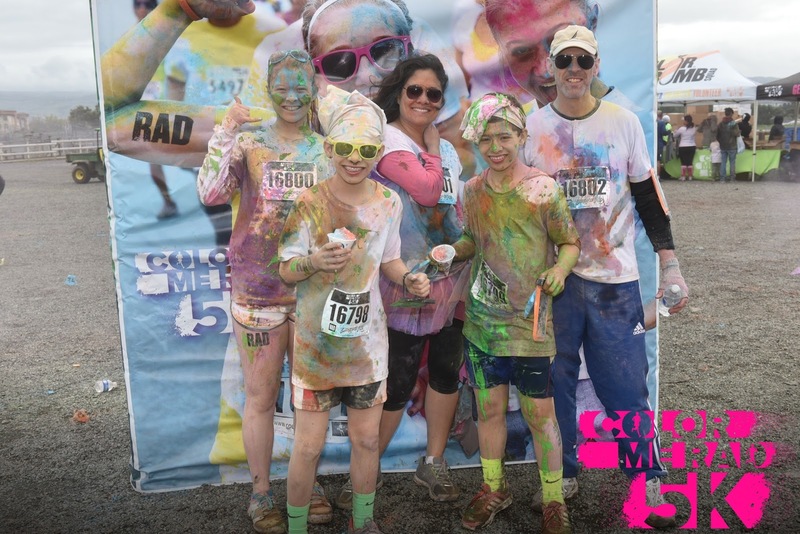 Color Me Rad 5K -- the perfect family fun run! 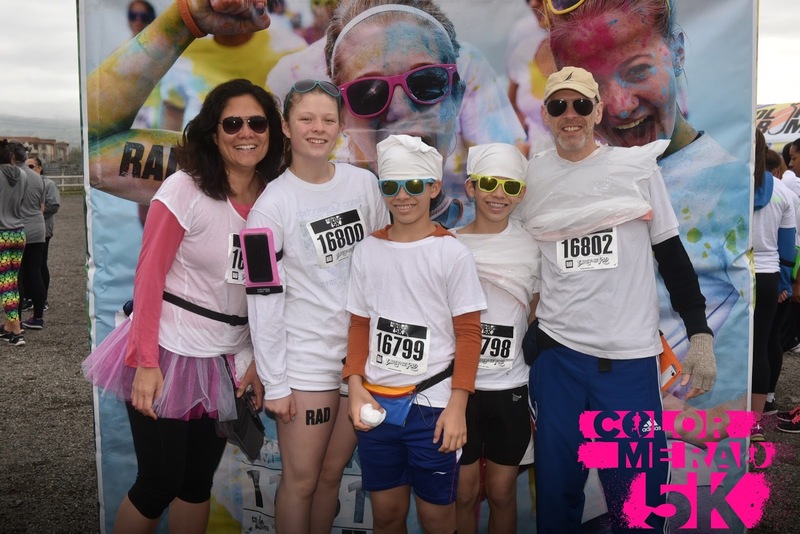 I've been on many fun runs over the years, but it's hard to imagine any run more fun than the one we enjoyed last week: the Color Me Rad 5k in San Jose. It was the first fun for everyone else in the family -- Alfie, The Pea, 3Po and Jammy -- but there is no better run to do for your first run, and there is no better run for the whole family to enjoy! Color Me Rad is loosely based on the Hindu Festival of Colors, otherwise known as Holi. The festive colors used are a sign of winter's end and spring's new beginnings. Or in the case of RAD; the color represents the end of lame runs and the beginning of fun runs. Start out as clean as a newborn babe, and throughout the run, our volunteers will coat you with liquids, powders, and gels of blue, green, pink, purple, and yellow until your face, shirt, and body come out silkscreened like a tie-dyed hippie on the other side. 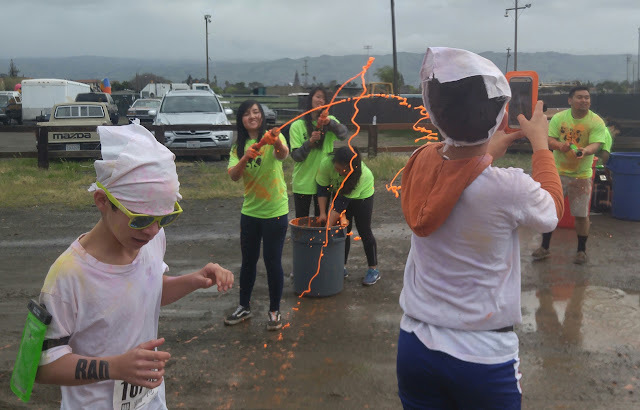 Each section of the run adds a new explosion of color to your clean, painter's palate until you cross the finish line into a final blitzkrieg of color. We all got up bright and early on Saturday morning and donned our white shirts (because they show the color better!) and race numbers. I had picked up our race packets the day before; each registered runner gets a race number, a waterproof phone case, a tattoo, and a pair of color packets to throw around before or after the race. Each of us brought sunglasses to protect our eyes as well as a cap or bandana to protect our hair. The Pea didn't want to wear anything on her head because she wanted her hair to get colored! The "fun" part begins even before the "run" part begins! About 10 minutes before start time, everyone gathered in front of a sound stage and did some warm up exercises to some catchy tunes and a DJ announcer. We had a great time following the Zumba instructors on stage, and afterwards, we were rewarded with some color bombs tossed out onto the audience! We got color on ourselves even before the run began! The run started about 15 minutes late, but other than that, the start was very well organized. Runners started the run in "waves", spaced about 5 minutes apart so that the start wouldn't be too crowded and no one would get trampled. I think they did a great job controlling the start waves. The course made its way around the Santa Clara County Fairgrounds. It was a pretty easy course, on a flat asphalt path with gravel or dirt on each side so runners could go off-road if their knees were giving them trouble. 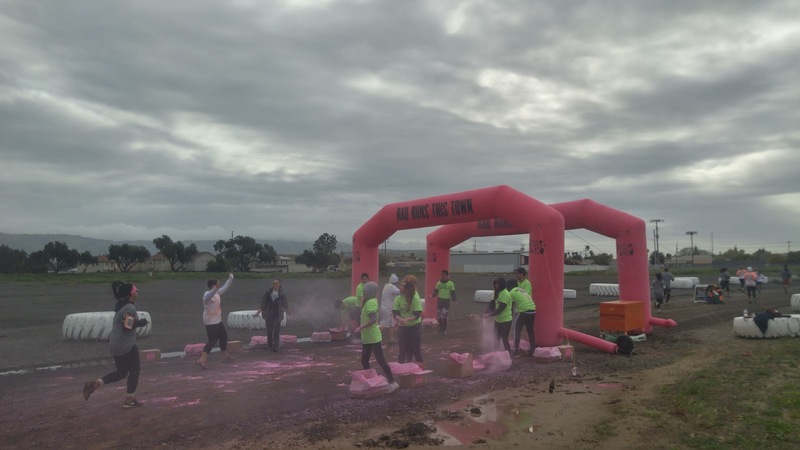 It had rained every day the week before, so in some areas the path was a complete and total mud pit -- so we had the added bonus of enjoying a mud run as well as a color run! We had to run through one area that got our shoes and socks completely soaked, and in some parts of the run, it got difficult to run because of all the mud caked on our shoes, but everyone was in high spirits and it was all in good fun. Time wasn't a big issue since we didn't have timing chips anyway; we weren't there to set any personal records, we were just there to have fun. As promised, runners/walkers passed through 4 (or was it 5?) color stations where volunteered doused everyone in color. Some stations doused you in powdered color (it's non-toxic, dyed cornstarch and it's safe to inhale in small amounts, but I recommend you hold your breath as you run or walk through!). Everyone absolutely loved it, and my boys actually stopped running and slowed down to a walk in order to make sure that they were completely covered in color! Two stations used liquid color instead of powdered color, which actually stayed on our shirts better than the powdered color. It was a cold, windy day, so we were freezing for a few moments after the volunteers sprayed us, but we were running, so we quickly warmed back up again. By the time you reach the finish line, you will be absolutely saturated in color! Not only that, after you cross the finish line, you are given two free color packets (they were generous that day and actually gave every 3 packets each) to add to your shirts, or to douse your friends in as they cross the finish line. Our "after" photo looked quite a bit different from our "before" photo! We all had a wonderful time. 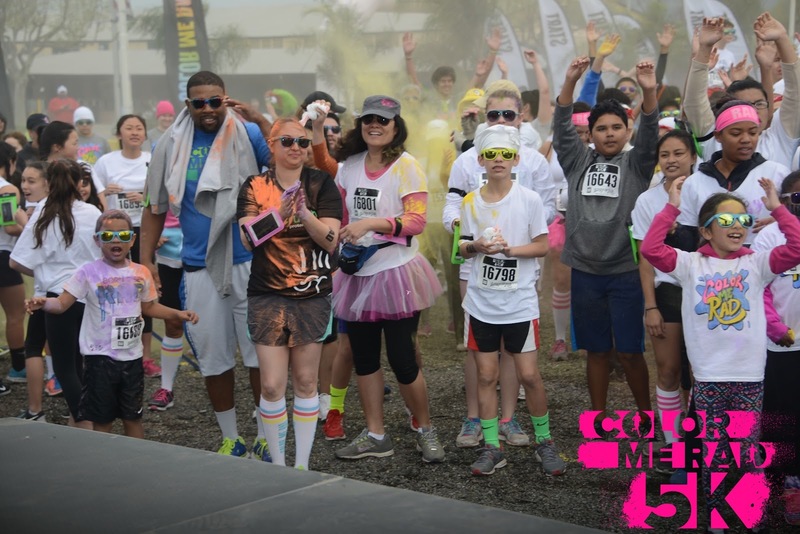 Color Me Rad really is the perfect family run, because it's just a short distance so it's easy to run, and if you don't want to run, you can walk, and with all that color, you have fun every step of the way. 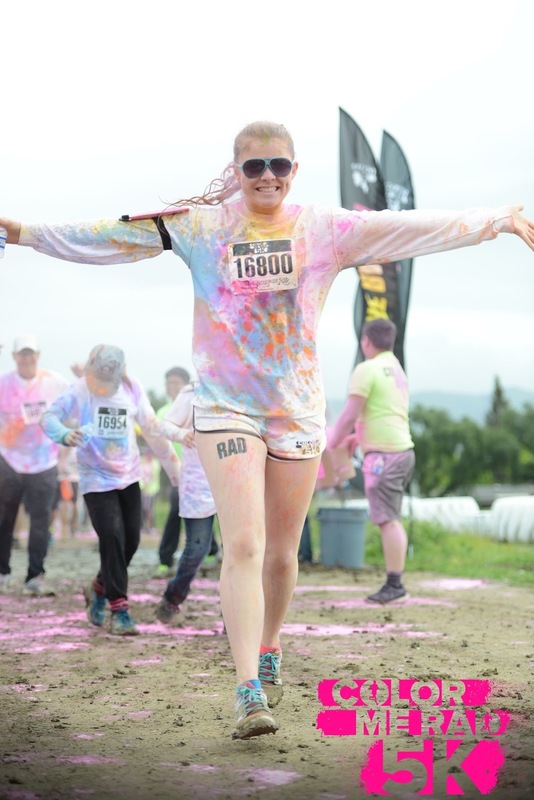 Disclosure: I received 4 complimentary entries to Color Me Rad San Jose. The views and opinions expressed here are my own.